Founded in 2016, like most casinos played by Europeans (yes, including the British), SpinIt casino is registered with a Maltese company. In this case, Genesis Global Limited, that also own ‘Casino Cruise’. 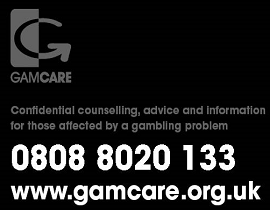 Though based in Malta, UK-based players will be happy to learn that they’re fully regulated by the UK Gambling Commission. As a relatively new casino, they have the attitude of any 21stcentury business: they’re innovative, fast paced; no nonsense fun is what they offer. Specialising in the video slots, the site is optimised for slot enthusiasts offering some fantastic incentives, e.g. fast play & free spins. And YES! Not just ‘Star Burst’ spins. If you’ve read my other reviews, you already know that I’m thoroughly bored of ‘Star Burst’. Unfortunately, the ‘Welcome Bonus’ does include ‘Star Burst’ spins – boooooooooooo! Did you know that your first impression of a person often determines the course of the relationship? Nalini Ambady’s research in social psychology (cited by Amy Cuddy in her TED Talk “Your Body Language Shapes Who You Are”) shows that first impressions influence life outcomes. E.g., when people watched 30-second (soundless) clips of interactions between physicians and patients, their judgements of the physician’s niceness predicted the likelihood of that physician later being sued by a patient. OK, great little titbit there, but what does that have to do with my first impression of SpinIt? Well, I wanted to stress the importance of first impressions because they have a significant impact on how we judge things – whether those things are people, services, websites, toys, etc., etc. With casinos, it’s vital they build an instant rapport with potential customers. The most important facet of this is ‘trust’. We need to be able to trust them with our money, bank details, and personal information, but also trust that the games are regulated properly. So, how were first impressions? 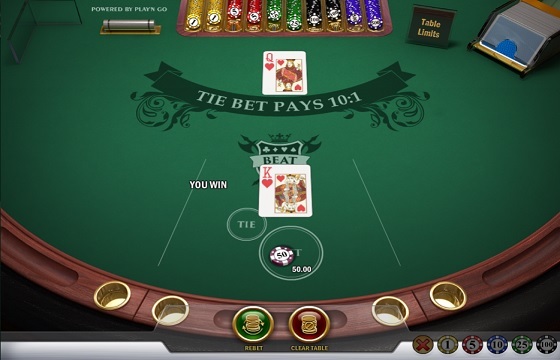 · It has a fun & funky look that isn’t that common with online casinos. · It has a cool colour scheme and is a great break from the usual darker (play-it-safe) schemes that you usually see with the online gambling sites. · There’s a very professional air to it. They list game providers, details of regulators, and accepted payment methods on the first page. · I definitely got the sense that they are trustworthy. You can tell that they’ve put the money in to create a decent site, and that always makes me feel as if I can trust the sites more than if it were a simple Word Press site. My verdict? A good first impression from a lesser-known casino. I’m optimistic that my time here will be fun. Is the Welcome Bonus as Warm as the Colour Scheme? When they said they were offering great incentives for slot enthusiasts, they weren’t exaggerating. For the first ten days following your initial deposit, SpinIt gives you 20 free spins per day to use on ‘Star Burst’. OK, so if they really wanted to make us slot enthusiasts as happy as could be, they might try offering the spins on another game. Seriously, though, does anyone know why the major only seem to offer free initial spins on ‘Star Burst’, and not another slot? Do they not realise that we slot enthusiasts like variation? A short attention span is literally the reason why we’re so attracted to the fast pace, instant gratification, of the slot machines. The first site to capitalise on this knowledge is going to make their customers very happy. I have to be fair here though. They’re offering me 200 free spins and that’s a fantastic incentive and one that I’m more than happy to take up. Also, the other casinos are the same, so this is not a dig at SpinIt in particular. In fact, I should apologise for being so ungrateful! Wagering requirements are x40, which is pretty standard for the online casinos and slot specialists. And What about Ongoing Bonuses? 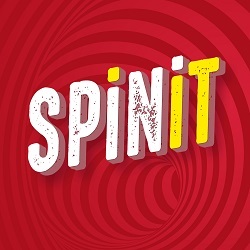 SpinIt offers various bonuses throughout their site. Every Monday you have the choice of a 25% match bonus on deposits and if you sign-up for their email services, they’ll send you details of free spin bonuses, free cash, and more. The best thing about their ongoing bonuses in my opinion is the free spins. For once, this is a casino THAT DOES OFFER FREE SPINS ON GAMES OTHER THAN STAR BURST! Woo hoo! A bit over the top in my reaction there, but it’s so refreshing to see. The best thing is that they frequently offer free spins on their new games, and they add new games fairly regularly, so that’s a decent amount of spins! This incentive is a massive brownie point in my book. SpinIt offers a wide range of banking options, with a choice of 20 different currencies. Security is a top priority. They use SSL connections for encryption purposes. They comply with PCI (Payment Card Industry) regulations in dealing with your banking information. This is a decent selection and perfect for those of you based in Europe. Unfortunately, they don’t accept US players. 1. You will be asked to verify your identity for any wins above €2300. 2. You can withdraw a maximum of £22,000 a month, and no more than £5500 per week. 3. With larger wins (£100K+), they reserve the rights to pay in monthly instalments for 10 months. If you’ve never had a big win, these restrictions may strike you as odd, but most of the online casinos have similar restrictions. With more than 1200 games, and new games added all the time, if you’re a gambler, you’re sure to find something you like here. As the name indicates, SpinIt concentrates primarily on the slots, but that doesn’t mean that they’ve completely ignored the other casino games, far from it, in fact. You’ll find a fantastic collection of live games, table games, and video poker. …but you’ll also find some less well-known providers. My favourite was Next Gen Gaming (NYX) for their fantastic game ‘Monster Wins’. While I didn’t get a monster win on this particular game, I definitely got a Mogwai-sized win. The video slots are where SpinIt really excel. 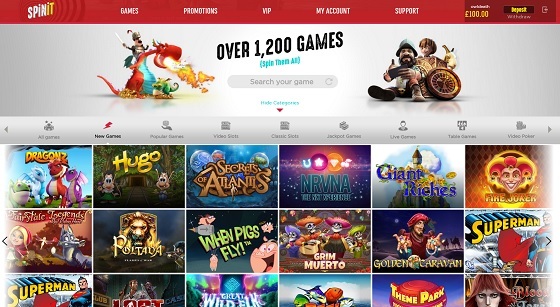 It’s clear to see that the site was made to cater specifically to slot enthusiasts. 1. 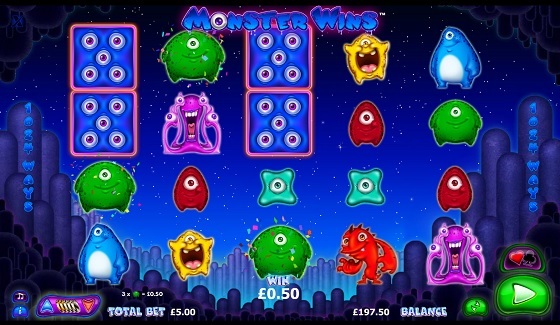 Microgaming’s ‘Giant Riches’: this was great fun to play. I always love the games that give me money (funny that), and this game was HOT! Giants aren’t meant to be friendly, but this one definitely was. 2. NetEnt’s ‘Tornado: Farm Escape’: this was great fun. Good graphics and great bonuses – what more could you ask for from a video slot? Also, I don’t know what it is about the video slots, but they seem to love building games around farm animals. There’s ‘Pigs Might Fly’, ‘Flying Pigs’, ‘Crazy Cows’, ‘Piggy Fortunes’, ‘Piggy Riches’, ‘Karate Pig’, ‘Big Bad Wolf’…OK, so it’s more pig based than farm based, but still, what’s up with that? I’m not a particular fan of the classic slots. I don’t know why, but I just find them a bit annoying to look at! There’s something about a one-arm bandit that makes me think they’re no fun – just a weird quirk on my part. For those of you without my weird hang-up, you’re well catered to here. They have a selection of 36 classic slot games, so there’s plenty on offer. Back in my territory again here, I love the Jackpot games. Again, they have a great selection, 21 in total. Some of their games will probably be familiar to you already: ‘Mega Moolah’, ‘Wow Pot’, and ‘King Cashalot’. While others might be new to you: ‘Speed Cash’, ‘Gift Shop’, and ‘Cash Splash’. 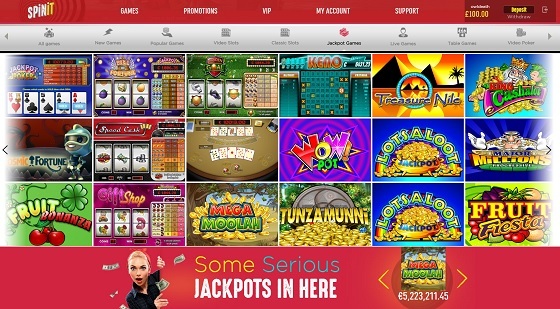 Spinit casino currently offer 42 different live games. This is far more than many of the other casinos that I’ve reviewed in recent months. Their games include all the usual games: blackjack, poker, roulette, and baccarat. There are different versions of each game as well so you can find double ball roulette, dragonara roulette, Turkish roulette, French roulette etc as well as several different versions of blackjack. The graphics are great. Occasionally, with these games, you can find that the jolt around quite a bit and that the mouth is out of sync with the voice, but these games are smooth. With 63 table games on offer, you have a decent amount of choice from SpinIt. My favourite was ‘Beat Me’. It’s really easy to play, you simply place a bet on yourself to win or for a tie and then you hit the ‘Deal’ button. You can’t bet on the computer to win, only yourself. Unless you choose the ‘Tie’ option, which with a random number generator (RNG) should roughly hit every 10 to 12 hands, you have a decent chance of winning. This game can feel really intense, especially when you’re on a winning streak. Again, you’ll find all the usual games – blackjack, poker, roulette, Punto banco, and baccarat – but also a few twists too, such as ‘Beat Me’ and ‘Red Dog’. ‘Red Dog’ is a bit unusual. You’re dealt three cards – the two outer cards face up and the inner card face down. You then bet on the likelihood of the middle card falling at a value between the two outer cards. E.g. if the left hand card is an Ace and the right hand card is a 10, you have a high likelihood of the middle card falling in between (i.e. being a 2, 3, 4, 5, 6, 7, 8, or 9). It gets a bit more complicated than this, but that’s that general gist. I had a good time playing this one and working out the extra bits and pieces. Again, they offer a nice little collection of games in this section of the site. You can choose between 27 different types of video poker. Only 9 games in this section, but they have my all-time favourite game (of the moment. I’m fickle) ‘Flying Pigs’. In my opinion, any site that offers this game is worth joining. I always have the best fun playing it. Be careful if you’re a bit impulsive: it can eat your money up fast. If you were an impulsive gambler, I’d create a personal rule of only playing this game with your bonus money! For those of you who love a bit of keno, you’ll find it in this section of the site. …so, I feigned an issue and got in touch. They have a live chat option, but you can also contact them by email and phone. I choose to use the live chat and it took around 5 minutes to hear back from them, which isn’t the best, but it certainly isn’t the worst. They’re a new casino, so I let them off the hook a little, as they’re still building their business and putting these things in place. They have to balance limited resources with providing us with a great service. Anyway, 5 minutes is OK.
SpinIt have both desktop and mobile options. You can play wherever you have an internet connection. The mobile and desktop versions have some variation in the games that they offer, so it’s well worth trying out both. I found both sites to be responsive and quick to load. Overall, Spinit casino is a very good site. They offer everything that I want from a casino that specialises in video slots, but they also offer a lot more too. Their choice of non-video slot games, whilst naturally less comprehensive than their video slot section is excellent nonetheless. I spent a good four or five hours playing through my first deposit and I didn’t get bored once. If video slots are your thing, and you like the rush of fast-paced, easy-to-follow gambling, then this is a great site to add to your inventory of fun online casinos.